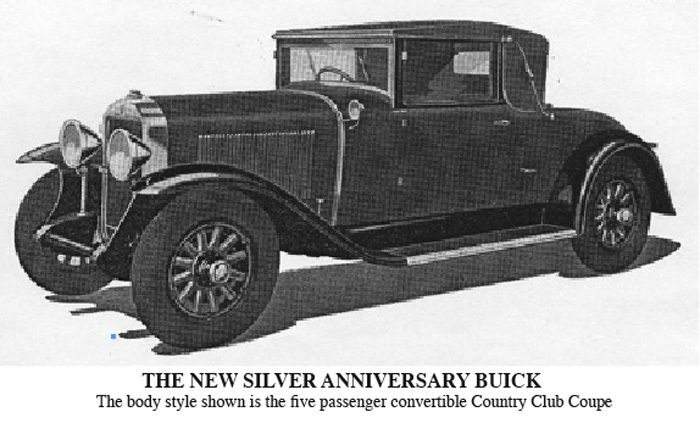 To mark the 25th anniversary of motor car production by the Buick factory, a new set of cars is announced to-day in Sydney. The new car is different in appearance from the model it has just displaced and a brief demonstration given yesterday by General Motors (Australia) Proprietary, Ltd., gave evidence of remarkable qualities. The first change noticable in the new design is the radiator, which has been redesigned on the lines which are fashionable at present, having depth, but comparatively narrow proportions, with a slight ‘roll’ to the edge of the body proper, perpetuated by a flute at the side of the hood and reproduced in cross section by the radiator front. A strongly marked feature of the new bodies is the definate separation of the superstructure, which is described as being, in effect, mounted on the body proper. The new bodies are, at first glance, larger and perhaps more bulky, but the design is cleverly carried out and a distinctive, attractive appearance is maintained. In the demonstration run the car was found to respond excellently, although it was taken straight off the assembly line at the Marrickville factory. Carrying six men it pulled straight away in top gear without any fuss or trouble from stationary on the rough overheadbridge at Tempe, acceleration was all that could be desired, while the steering was delightfully light and responsive. Taken to Coogee it climbed the southern side of Arden street in top gear, with full load and only needed a reduction to second for a few yards of one in eight leading off the old Baden Hill, on which it did not get a fair run, as the course was suddenly changed almost at right angles when three-quarters of the way up the hill to get on to the more severe grade. With four on board, and a very short run to start, the car climbed the northern side of Arden street, with power to spare in top gear. The new car has a slightly larger engine with the outstanding Buick features retained; the capacity is about 15&1/2 per cent greater than last year?s standard model. Petrol is fed directly to the carburettor by a pump working at engine speed, and a new carburettor, fitted with two high-speed jets has been adopted. A change has been made in the ignition coil, affording a hotter spark at lower engine speeds. The shorter car now has a wheelbase of 115&3/4 inches, more than an inch more than that of the old model; the Master Six wheelbase, however, is only three-quarters of an inch longer at 10 feet 8&3/4 inches. The double drop frame is strengthened, the clutch has been radically changed to ensure easier engagement, lubrication is improved and the gears are more silent; and the maximum horsepower developed increased to 74 in the standard model and 91 in the larger ones. Altogether the new Buick proved a very fine car. It will be supplied in a number of open and closed body types, the great Silver Master Six sedan being one of the most luxurious family cars imaginable.